I have enjoyed over the past week reading why a bunch of moms can’t find the time to work out or don’t have wash board abs, toned muscles and gorgeous hair. It’s taken me awhile to get to my excuses posted because I have a gazillion reasons why I don’t look like a super-fit mom, but I’ll keep to the short list. This list could go on and on. Here’s the deal, DESPITE all of these excuses, I eventually lost the baby weight and even just ran 7.3 miles for a race. Because that’s all they are. They are excuses, not reasons. It’s about priorities and I have to make myself a priority. It took almost 18 months after Charlie was born to lose all the weight and I still don’t have wash board abs. Why? Because I don’t need them to be a good mom, but I do need the physical activity to make me a better mom. I can hold Crow in yoga, but my arms aren’t perfectly sculpted. I’m pretty sure at some point someone replaced my armpits with that of a 300 pound person. It’s not about what I look like though it’s because I function better with the physical outlet. It’s just how I relieve stress. I also find that it’s more excusable to wear yoga pants everywhere if at some point I have worn them for yoga. And I do wear them everywhere. I spend the day making sure everyone’s needs are met. From my family to work, I am constantly answering the complaints of others and making them better. I would count on Stampy to make me feel important but this is the same guy who took costume jewelry out of his pocket and said “I got you something” to propose. Seriously. So, I make the choice to say “I am important”. I make the choice to take care of myself and occasionally put my needs first. I take care of myself so I can take care of others effectively. And if nothing else, it gives me an hour to myself. When I can’t even take a shower or pee by myself at least I can get on the road and run by myself. And as much as I can (and will) complain about Stampy, he gives me the opportunity to better myself week after week. That being said, maybe yoga and running isn’t your thing. Maybe physical activity isn’t your thing at all. What the activity is isn’t important, what is important that you do what makes you happy. That you give yourself some time to be healthy and to praise yourself (Look what I can do!). Make yourself a priority, take time to take part in your hobbies, just get a breath of fresh air with some friends that doesn’t include a playground. I think if we can put ourselves first once in awhile, we can find happiness and the ever important message that “I am important”. It also helps to surround yourself with people who love what you do…. 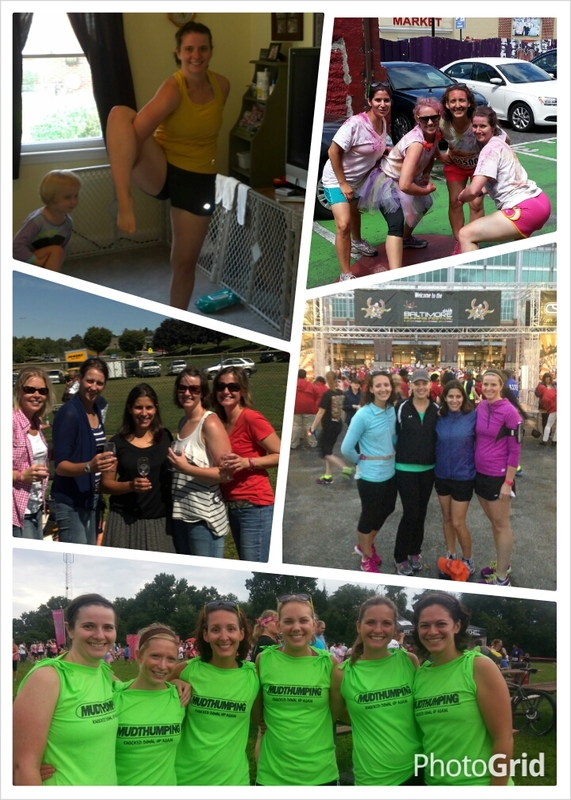 whether we are running, doing yoga or drinking wine we always have a great time. This is so true. I am having a hard time finding time for me. And I get irratated with my husband because it seems he finds all the time in the world because of his work schedule. I feel the Mommy guilt when I have to leave B with someone other than Tim. I feel like people get irratated with me or judge me when I ask them to babysit so I can go workout. How do I get over it? Bring B to me, I will gladly watch him. This is still difficult for me. The playroom at the y has been awesome and the kids love it there so that’s where I usually take them if Seamus isn’t around. But rarely do I try to get a babysitter. My biggest obstacle was literally not feeling guilty about sending extra time away after working too, but I figure a happy mom is better than a grumpy mom that is drinking by noon.